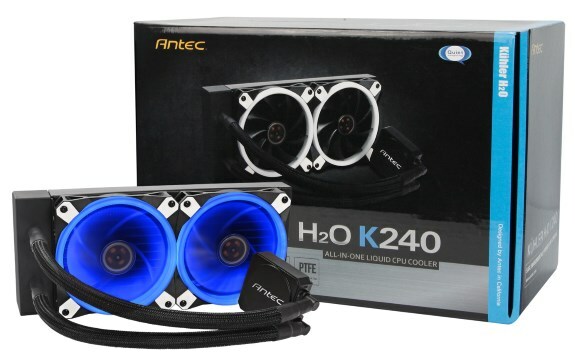 A new watercooling series from Antec hit the scene. The company introduced the H2O Kühler K120 and K240, these 120mm and 240mm kits will be sold for 45EUR and 65EUR, respectively. Antec Inc., leading provider of high-performance computer components and accessories for the gaming, PC upgrade and Do-It-Yourself market, are launching new models of their renowned H?O Kühler All-in-One Liquid Cooler series. The Kühler K120 and K240 are the newest generation of all-in-one closed loop liquid CPU coolers, and uniquely engineered to protect the CPU's performance and ensure its performance for years to come. The K120 and K240 are commercially available now for €45 (K120) and €65 (K240).